In over 16 years of activity, Gabriela has gained an impressive level of experience and deep understanding of various industries. She co-heads the Energy and Natural Resources practice of the firm together with Ruxandra Bologa and the Corporate/M&A practice with Ruxandra Bologa, Adina Chilim-Dumitriu and Adriana Gaspar. Always focused on understanding each business and adapting to the client’s profile, she has represented international and local corporations and private equity funds, as well as public institutions in structuring, negotiating and achieving the successful completion of their projects, being involved in a significant number of high profile M&A transactions and privatisations. Clients say that she “has an exhaustive understanding of the energy sector”. Gabriela Cacerea is sought for her broad knowledge of EU legislation and its interaction with the energy sector. 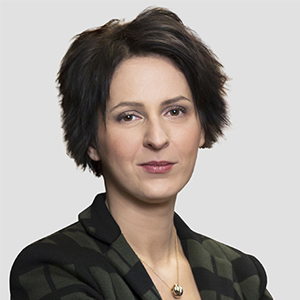 Gabriela Cacerea has a good reputation across the energy market for her regulatory expertise, especially relating to renewable issues. Gabriela Cacerea is well known for her experience of electricity and renewable energy matters. Clients say she has “very extensive knowledge about Romanian laws”. Gabriela Cacerea is praised for her impressive level of experience in energy and her thorough approach, with one client stating that she “leaves no stone unturned”.